A new Weekly Battle Contest has just started. This week's opponent is Mommi, you will need to have a Mommi Trading Card in your Battle Deck. The challenge is to win as many battles against this opponent this week. The top 3 players at the end of the challenge will receive a Snoogle Trading Card, 200,000MP and a Gold Trophy, the next 6 players will receive 150,000MP and a Silver Trophy and the next 9 players will receive 100,000MP and a Bronze Trophy. A new feature has been added to Nimbus. Pet Lending is where you can safely lend one of your pets to another player without fear of it not returning. If the player accepts a pet you lend them, they will have to pay both of the MP transfer fees, which are the sending fees and returning fees. Any pet that you lend to a player will automatically return to you by the time that you select. You cannot receive it back early unless the player lending your pet sends it back early. While the player is lending your pet, it will be safe from any changes in a special Nimbus cloud. You will be able to earn certain Avatars, Goals, Photos, Plates etc while you are borrowing a pet. The Lottery has been drawn for this week. jammybae is the winner of the 631,200MP Jackpot with the winning numbers of 1, 11, 23, 24, 31 and 46. Congratulations! Coffee is back under new ownership and can be invested in again. Shares are starting at 598MP. Last Week's Raffle has now ended. HedgeHog90 is the winner of the Red DNA and 100,000MP prize with the winning raffle ticket number 277! Congratulations! Make sure you buy your tickets for today's raffle - only 10MP per ticket! All pets wearing a Chibi Costume will receive Double Training stats this week at the Gym and Elite Gym. Vote Now for next week. All pets wearing a Teal Costume will receive Double Education stats this week at the School and University. Vote Now for next week. A new Bearber Treasure Map has been added to the Treasure Maps shop on Minipet Island. Collect and complete all 16 pieces for FREE lifetime access to Facial Hair at the Vorter Park Bearber. Can you find the 'Bearber' Hidden Avatar? A new Native Fairy prize has been added for those who have completed 19 maps, instructions or passes. A new game has just been released. Play Pipe Dream for a Fake Ten Dukka Coin every 2 hours. The pipes of the City Sewers are leaking and Cornelius the Basil needs your help to block the flow of sewage into his house. In each game you will roll two dice and then choose a numbered pipe to block. For example, if you roll a 1 and a 6 on the dice, you will be able to block Pipe 1, 6 or 7 (the total of both dice). Every time you block a pipe you may randomly win Minipet Poop or Fertiliser. If you manage to block all 9 pipes you will win the MP Jackpot. Pipe Dream has been added to the City Sewers map and the Points to Play Games countdown page. A new Weekly Quest Contest has just started. This week's quest game is Kamilah Traveller. The challenge is to complete as many of these Quests this week. The top 3 players at the end of the challenge will receive a Advent Costume, 200,000MP and a Gold Trophy, the next 6 players will receive 150,000MP and a Silver Trophy and the next 9 players will receive 100,000MP and a Bronze Trophy. Many, many years ago Ziranek was home to MaraUploads. This feature was discontinued but a 'Memory Upgrades' feature remained around as a useless dead feature for a long time. This feature was finally removed but there was an empty space in Ziranek and 'Memory Upgrades' has now been changed to a 'Memory Saved' shop. Although we do not actually need to save server space, the idea is that you earn 1 Memory Point for every item you delete at the 'Move Items' quickstock page at your Inventory. You can change the donate option to delete option. This new Memory Shop will permanently give an extra use to any items that become junk items of little value by removing them from the site. You can't delete Dukka Coins and Fake Dukka Coins as these items are currency that have their own currency exchanges and have (or will have) their own shops. A new Weekly Item Contest has just started. This week's item is Orange Chocolate Ushunda, you will need to send this item to the 'Challenge' account. The challenge is to send as many of this item to 'Challenge' this week. The top 3 players at the end of the challenge will receive a Lemon Gummy Heart, 200,000MP and a Gold Trophy, the next 6 players will receive 150,000MP and a Silver Trophy and the next 9 players will receive 100,000MP and a Bronze Trophy. We have fixed several old Clothing items and are working on fixing even more. The Steampunk Suit, Lotus Suit and Villain Suit have now been fixed. The Cotton Candy Male costume is now Cotton Candy Fluff, Spring Male Costume is now Woven Branch Belt, Lorius Male Costume is now Lorius Wings, Lorius Warrior Male Costume is now Lorius Summoning Stone, Pilgrim Male Costume is now Pilgrim Tunic, Native Suit is now Native Skirt, Blue Fire Suit is now Flaming Tank Top, Shark Male Costume is now Shark Tail, Chinese Suit is now Ornate Shirt and Pilgrim Lady Costume is now Pilgrim Hat. 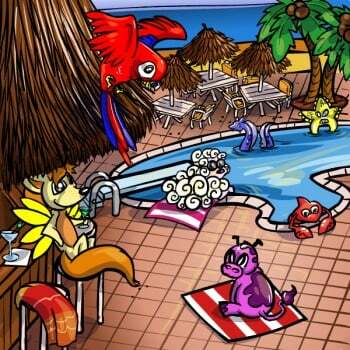 The Resort on Minipet Island used to be a feature where you could pay for your Minipets to be looked after so that they didn't run away. This feature was discontinued and looking after Minipets was removed, making this feature pointless. We have changed the Resort. You can now pay 2,500MP once every 24 hours for one of your minipets to visit the resort and receive a souvenir Minipet Plate. A new Weekly Battle Contest has just started. This week's opponent is Bad Egg, you will need to have a Bad Egg Trading Card in your Battle Deck. The challenge is to win as many battles against this opponent this week. The top 3 players at the end of the challenge will receive a Zetzilla Trading Card, 200,000MP and a Gold Trophy, the next 6 players will receive 150,000MP and a Silver Trophy and the next 9 players will receive 100,000MP and a Bronze Trophy. The High Scores List now automatically removes inactive players. If a player has not logged in for 180 days they are removed. As soon as that player comes back and starts to play again they will be added back to the list. Players who have not logged in for the past 180 days are automatically removed from the Gallery Search. This means that they will no longer win the Greedy Fairy prize. We have changed what items Missions ask for. Missions that ask for items from your collections will remain the same but missions that take items from you, such as Blitzen, can now ask for *any* item that is not retired and is available on the site. Several times a day a script will run to check how many of each item is on the Shop Search, Galleries, Trades and active player accounts and when the quantity of this item gets low it is automatically removed from missions. This means that missions can now ask for goals items! Photo and Plates are NOT included and can still be asked for as normal. Remember to always check what items the mission could ask you before you start a level and let us know if you think there is a mistake before you start. The Lottery has been drawn for this week. erw926 is the winner of the 659,300MP Jackpot with the winning numbers of 15, 19, 22, 24, 25 and 33. Congratulations! Last Week's Raffle has now ended. Nicky is the winner of the Red DNA and 100,000MP prize with the winning raffle ticket number 4535! Congratulations! Make sure you buy your tickets for today's raffle - only 10MP per ticket! All pets wearing a Camouflage Costume will receive Double Training stats this week at the Gym and Elite Gym. Vote Now for next week. All pets wearing a Snow Costume will receive Double Education stats this week at the School and University. Vote Now for next week. A new feature has been added to Ziranek. The Arcade Fairy rewards you for the number of flash games you have played. The Arcade Fairy has been added to the Rewards page and Ziranek map. Can you find the 'Arcade Fairy' Hidden Avatar? There are two new Giftbox items for you to collect. The Vortex Park Reservoir Giftbox will allow any player that has access to the Vortex Park Reservoir to visit once every 12 hours instead of 24 hours for life. The Arcade Giftbox will reward you with DOUBLE GAMES POINTS for all Flash Games scores for life. A new Gardening feature has opened in Gigantic Paradise. Now that the Marahomes feature has been discontinued permanently, this new feature is a way for you to plant your Seeds. You can use this gardening feature to plant seeds, water them and use Fertiliser to grow an Organic Minipet. These Organic Minipets will now grow much, much quicker than before but you can only grow one at a time. A new Weekly Quest Contest has just started. This week's quest game is Eleka Prison. The challenge is to complete as many of these Quests this week. The top 3 players at the end of the challenge will receive a Gingerbread Costume, 200,000MP and a Gold Trophy, the next 6 players will receive 150,000MP and a Silver Trophy and the next 9 players will receive 100,000MP and a Bronze Trophy. A new Weekly Item Contest has just started. This week's item is Red Yuni Balloon, you will need to send this item to the 'Challenge' account. The challenge is to send as many of this item to 'Challenge' this week. The top 3 players at the end of the challenge will receive a Firework Potato, 200,000MP and a Gold Trophy, the next 6 players will receive 150,000MP and a Silver Trophy and the next 9 players will receive 100,000MP and a Bronze Trophy. Be sure to enter the Monthly Checklist this month! There will be 50% more winners of Account Upgrades credit this month, to celebrate 13 years of Marapets. King Baspinar loyalty system now rewards players up to 13 Years of prizes. We have also changed the way prizes are awarded. Every player will only receive one prize per day. This is to stop players who have not visited for years coming back and receiving all prizes at once. The Addow and Sybri can now wear the Party Costume. The Party Chibs and Yuni have been revamped. A new Weekly Battle Contest has just started. This week's opponent is Spam Fairy, you will need to have a Spam Fairy Trading Card in your Battle Deck. The challenge is to win as many battles against this opponent this week. The top 3 players at the end of the challenge will receive a Pembe Trading Card, 200,000MP and a Gold Trophy, the next 6 players will receive 150,000MP and a Silver Trophy and the next 9 players will receive 100,000MP and a Bronze Trophy. The Lottery has been drawn for this week. Ashmiyah is the winner of the 508,900MP Jackpot with the winning numbers of 21, 30, 34, 36, 43 and 49. Congratulations! Last Week's Raffle has now ended. Kyoto is the winner of the Red DNA and 100,000MP prize with the winning raffle ticket number 2371! Congratulations! Make sure you buy your tickets for today's raffle - only 10MP per ticket! The Game of the Week has changed to Fropa Attack. All pets wearing a Pinata Costume will receive Double Training stats this week at the Gym and Elite Gym. Vote Now for next week. All pets wearing a Pinata Costume will receive Double Education stats this week at the School and University. Vote Now for next week. Okay, we are a little early! Marapets will be a teenager on Tuesday but our 13th Birthday Party celebrations have just started. We have 2 new events that will run until September 10th. Our 13th Birthday Party has started! The Birthday Forum is now open for you all until September 30th. We need your help inviting as many online players to the fun! Visit a user's profile and hit the 'Happy Birthday' button and they will be invited to the party. Each player is different - some won't party, some will and others will have the best time ever! The respone of the character will depend on what prize you receive. You can only invite a player who is currently online and can only invite the same player once every day. Each player can only be invited once every 30 seconds. You will receive MP or one of 24 new Pinatas as a prize. At the end of the event, the top 100 players who collect the most gifts will receive 1,500,000MP and a Partysaurus Trading Card! 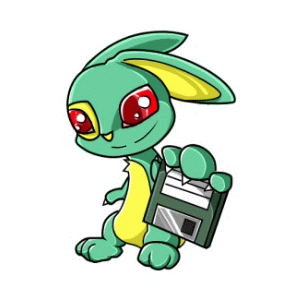 The next 300 players will win a Partysaurus Trading Card. Posting the 13th Birthday Cake image on profiles, siggies, etc is confusing to other players and, as usual, is not allowed. If you are asked to remove the image and do not do so, your account may be frozen until the end of the 13th Birthday celebrations. Griffin has just been released in Vortex Park. Griffin is an especially powerful and majestic creature. Griffin has the coordination to live and fly around Vortex Park even with the permanent hurricane weather conditions. The higher your pet Coordination is, the greater he will reward them. 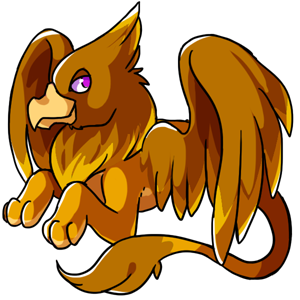 Griffin has been added to the Vortex Park world map and the Rewards page. Can you find the 'Griffin' Hidden Avatar? The Gruffle is also avaliable in these different colours. A new Weekly Quest Contest has just started. This week's quest game is Hump Racing. The challenge is to complete as many of these Quests this week. The top 3 players at the end of the challenge will receive a Midnight Costume, 200,000MP and a Gold Trophy, the next 6 players will receive 150,000MP and a Silver Trophy and the next 9 players will receive 100,000MP and a Bronze Trophy. A new Wonderful Wizard Treasure Chest is on sale at the Account Upgrades Shop. It will automatically retire October 15th. You can open this item to receive 8 different, random new items, including new clothes, wigs, contact lenses, masks, hats, minipet, gourmet food and accessories. You will not receive duplicate items inside a single treasure chest. Can you find the 'Oh My!' and 'Toto' Hidden Avatars? A new 'Yellow Brick Road' experience has been released. Can you find it? Toto is also avaliable in 12 different colours. A new Weekly Item Contest has just started. This week's item is Spiked Helmet, you will need to send this item to the 'Challenge' account. The challenge is to send as many of this item to 'Challenge' this week. The top 3 players at the end of the challenge will receive a Orange Gummy Bottle, 200,000MP and a Gold Trophy, the next 6 players will receive 150,000MP and a Silver Trophy and the next 9 players will receive 100,000MP and a Bronze Trophy. A new Weekly Battle Contest has just started. This week's opponent is Gobble Knight, you will need to have a Gobble Knight Trading Card in your Battle Deck. The challenge is to win as many battles against this opponent this week. The top 3 players at the end of the challenge will receive a Commander Zerk Trading Card, 200,000MP and a Gold Trophy, the next 6 players will receive 150,000MP and a Silver Trophy and the next 9 players will receive 100,000MP and a Bronze Trophy.